iOS 5 update rained on by iCloud? In somewhat major blow to anti-piracy efforts Microsoft Windows 7 Ultimate activation crack is now available before the official release of the software, the OEM SLP Master Product Key based activation crack completely bypasses the Windows Genuine Advantage validation allowing users a fully functional unlocked copy of the operating-system, the crack was made possible by extracting the OEM certificate and key from .wim files contained in leaked Windows 7 Ultimate OEM DVD ISO from Lenovo. Microsoft makes use of SLP (system-Locked Preinstallation) for pre-activating Windows meant for volume licensing by OEM's like Lenovo and Dell, Windows 7 makes use of OEMID (identified by BIOS SLIC table) to identify OEM computers for pre-activation, crackers have now came up with automated utilities (as shown above) which make use of Lenovo's OEM key and OEMID to fake identification as an OEM system allowing Windows 7 Activation. The first of its kind automated Windows 7 Ultimate activation crack by cracker named HAZAR is just 175 KB in size and is reported to work well on Windows 7 Ultimate 32/64 Bit versions. 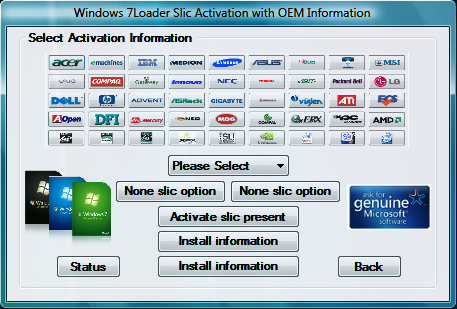 UPDATE : Another Windows 7 Ultimate activation cracker is now surfaced named 7Loader Release 4 the loader features a GUI and have options to customize OEM information from various options provided. Note : This post is intended for news purpose only, using these kind of hacks and cracks pose a great security risk and should always be avoided - We have to disable the comment section as things are now getting out of hands. This application started off as a proof of concept. Everyone at the time I made this was using batch scripts as the back end to their activation techniques and although batch file installation worked it's success rate was poor when compared to my demo application. The goal of my program at the time was simple, prove that an application can do everything the batch file can do but in a controlled easy to use way with little to no errors. Not only that though but to show that you can display useful system information and options to the user which a batch file simply can't do. This program to this very day is still the only fully coded API driven application that handles it's own errors and depends on itself. It's the original program based loader and it's arguably the best loader based program to get you activated out right now with over 10,000 downloads and counting and a strong fanbase behind it. Whats the goal of this program? To activate you in a clean and simple way without putting a load of buttons and checkboxes on your screen and expecting you to know what to do. It's all about keeping it simple! What makes this different from every other loader out at the moment? It's the only fully coded API based loader application, this means it cuts out the middle man (.NET framework) and can handle everything on it's own. This increases reliability and is considered the professional coder approach. So whats the advantages and why should you care? With me building this loader as an application I can access system details and create declares for many of the functions. This means anyone that uses this loader should have a greater chance of success! Whats the differences between each loader option? Each option uses a slightly different method to get you activated, of course the custom menu.lst option should be ignored unless you know what you're doing. OK so how do I run it? In general you simply press Install! I activated Windows 7 and now I want to activate Windows Vista, why isn't it working? Use the uninstall option while on Windows 7 and reboot into Windows Vista. Next install your selected cert/slic in Windows Vista and then reboot back to Windows 7 and click install. Try again with one of the other loader options, maybe one of them might just work for you. Hover your mouse over the green, amber or red icon towards the bottom right of the window to see the information. I should note that even if the icon is green someone might have found a way around it so it's worth checking that the applications path is always the same as the location from where you launched the application. You should also check that the MD5 matches the MD5 found online. * 1.6.8 -- Added application integrity checking. This is a new feature which will display you with information about how the application was launched when the mouse is hovered over the green or red icon. It's goal is to inform you if you are running an untouched version of the application or one that could have been modified in some way by a script kiddie. Of course green is the best result, if it's red then be cautious as someone's likely binded a trojan! HELP me get the Link !!! well i m trying from last 2 hours. let see wat u got. I see all these people who are happy from this. Can I get a key too please??? Pls send me the crack.. more power! plis send me that key too!! Hey could you please send me the download link for the windows 7 ultimate crack, thanks alot!! can i get the crack too pls? Pleeease send me link for activation key. Thanks a lot. This sounds like Perfect thing! Could you be so nice and send me that link aswell ? pleasseeee send links to my email!!! hi can u send me this tool too plz ? Can U send me link for download win 7 activator. Tanks! Can send me the link download. thx! Hey man..Could u pls send me the crack for windows 7 ultimate..This is my E-mail I.D ashiq128@gmail.com.. Thanks. Please can you provide the link to download this software so that my windows 7 ultimate wont get expired.Thanks. Please send me the link for crack windows 7 ultimate . can u please send me d download link or d activation code?? where is the download link? For Windows 7 Ultimate Edition. Supports slic and none slic enabled BIOS. I used it and it really worked. There was no need to update BIOS or anything. Just run the small application, wait for a minute or two and after a reboot, its activated. Works very nicely. wher did u get the link to download. Where did u find that crack ? I look for everywhere. Don't play with people's time..........can u provide exact location of this activation key? Hello Hope someone can clarify. If you presently are running Windows 7 RC does this new crack code allow for full function of Windows 7 RC? Or. Does this mean have to download a newer version of Windows 7 Ultimate and use the new crack code on a new install of Windows 7 Ultimate? If so where can one find new version of Windows 7 Ultimate? Thank you sorry for not understanding. @ my hp netbook both crack didn't work. can somebody help me pls. how do i use this? how abt adding the file to a Rapidshare.com collector/premium account. it has exceeded the limit of 10 downloads. i try it on aa acer laptop, works just fine..thx to all...just one question...does this means the windows now can be update just like the original windows? Anybody know where is the download botton ? I look for everywhere but cant find. pls help me some one. Is Windows 7 Ultimate 64 avable any where for download? Where can I download Windows 7 Ultimate? i have a problem, i can't donload that crack.. i hope anybody can give me a link.. help me please..
i want windows 7 ultimate 64 bit activation key. can any one give me? or any one can paste it over here? IS IT WORKS WITH ANY BODY ON HP LAPTOP ????????????????????????????????????????? do you mean where you are? not where are you, because that is a question. hi i want to windows 7 ultimate crack pls help me ... ! can any one give me ? Used Hazar's activator..this is unbelievable way to go HAZAR you are the best!!!!!!!!!!!! Do You have a new link? Hi i want a activation crack to Windows 7 Ultimate 64bit operation system. If u have means pls send to abdulsoftdrive@gmail.com. After 3 days a activation key was asking me.. Please tell me how to crack a activation key..
i have download activation hazar. that is not installed in my ststem but so many virus installed in my system. that rar file have so many viruses. CAN ANYONE SEND ME THE WINDOWS 7 ULTIMATE CRACK.... I NEED IT BADLY I HAVE ONLY ONE DAY LEFT AND MY SYSTEM WILL GO OF.... bebejosopo@yahoo.com PLZ SOMEONE HELP ME. PLZ SOMEONE SEND IT TO ME.. Need windows 7 ultimte 32bit activation code!! can anybody provide me the windows 7 enterprise activation code? Where is The Download Button ??? I Can't find Here ??? hi' link for acivation window 7??? please??? is there any way to use win 7 lifetime without any crack/patch like kis/kav ...? (reactivate trail period again again by converting it to beta in each month)...? Hi I need the crack badly..
can anyone find me a patch file for windows7 ultimate built 7600.
i want to pass the message that says : THIS COPY OF WINDOWS IS NOT GENUINE . plz help me to activate this version of windows.. I want Windows 7 ultimate activation key. Please provide me at my email id "avinash_manuvns@rediffmail.com"
I see no big in all these noise. Go and buy Big Blues wonderful GENUINE OS. plz send me the activation crack for win 7 ultimate evaluation..
what is a key for windows 7 ultimate? plz can i have the link? I HAVE LESS THAN 2 days to activate Windows, somebody help please, it would be greatly appreciated. I have windows 7 ultimate 64 bit, my email is papi_gill@hotmail.com. hey pls email me the Windows 7 Ultimate Activation Crack. Can someone send me the activation crack to win 7 ultimate ? I need to an activision code. Hello ! I would like to take an activision code or crack,please canyou send it to me.Please,i need an key for win 7 final.Thanks. please, send me crack on grim@inbox.ru. Thanks! please send me crack for windows 7, i've tried the hazar on my laptop and it does not work, is there a reason for that. laptop missing a 'base system device' driver i don't know if that is the problem. also the laptop does not find the wireless, and asks for 'network security key'. I need crack for windows 7 ultimate..
What is Microsoft KMS Activation and how it works ? Download Microsoft DirectX 11 For Windows XP And Vista ! Do subscribe to updates using your favorite RSS feed reader or using the secure FeedBurner email update form on top of this post.